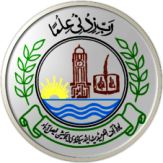 The Board of Intermediate and Secondary Education, Faisalabad is the intermediate education governmental body in Faisalabad Division. The Board came into being in 1988. The Board conducts Matric 9th and 10th class exams and Intermediate part I and part II exams every year. A great number of students participate in these exams every year. The exams mostly started in the month of March and ends April while the results of BISE Faisalabad Board announced in the month of July and August. The matric result usually announced in the month of July every year while the inter result announced in the start of September or last of August every year.